Tick bites are painless and do not itch, so ticks may go unnoticed for a few days. After feeding on blood, ticks become quite swollen and easy to see. Ticks will eventually fall off on their own after feeding on blood for 3 to 6 days. Most tick bites are harmless and the spread of disease by ticks is not common. Even in high risk areas only 2% of deer tick bites cause Lyme disease. Ixodes Scapularis, more commonly known as Deer Ticks are between the size of a poppy seed (pin head) and an apple seed, and can sometimes transmit Lyme disease. Ticks usually need to attach for 24 hours to transmit Lyme disease. Your greatest risk for deer tick bites are any time the temperature is above freezing - the greatest risk is spring through fall. Lyme Disease – A bull’s-eye rash (an expanding red rash) is often present after Lyme transmission. The rash measures more than 2 inches across at the site of the tick bite, this may occur within a few days to a few weeks. Other symptoms of Lyme disease may include fatigue, muscle and joint pain, headache and fever and chills. Dermacentor Variabilis or Dog Ticks are the size of a watermelon seed and can sometimes transmit Rocky Mountain spotted fever and Colorado tick fever. 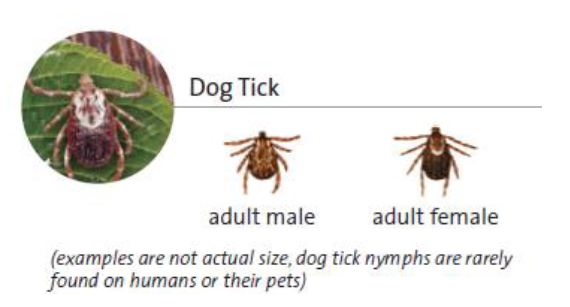 Dog ticks do not transmit the agent that causes Lyme disease. Remove ticks immediately upon recognition. Ticks usually need to be attached for 24 hours in order to transmit Lyme disease. Removal using a tick spoon → Place the widest part the notch on the skin near the tick (hold the skin taught is necessary). Apply slight pressure downward on the skin and slide the spoon forward so the small part of the notch is framing the tick. Continuous forward sliding motion of the spoon will detach the tick. Removal using tweezers → Use a pair of fine-tipped tweezers. Grasp the tick as close to the skin as possible (on its head). Gently pull the tick straight upward without twisting or crushing it. Maintain a steady pressure until the tick releases its grip. Removal of the tick’s head → If the wood tick’s head (mouth parts) breaks off in the skin, remove any large pieces. Clean the skin with rubbing alcohol and then use a clean pair of tweezers to scrape the head off. If a small piece of the head remains in the skin the body will eventually shed it during the healing process. Deer ticks that are not engorged may need to be scraped off, you can do this by using the edge of a credit card. Covering the tick with petroleum jelly or nail polish to remove it doesn’t work. Neither does rubbing alcohol or a soapy cotton ball. Touching the tick with a hot or cold object also does not work. Try one of the methods outlined above to remove any ticks. After the tick is removed, wash the wound with soap and water. Remember to wash your hands when you are done as well. These steps will help prevent catching any infections carried by the tick. Apply an over the counter antibiotic ointment to the tick bite once. Prevent Tick Bites → Use caution in tick infested areas. After being outdoors in areas with deer ticks, check for any ticks and remove any that are attached. Wear light colored protective clothing. Tuck the ends of your pants into your socks and use a bug repellent on shoes, socks and exposed skin. Tick Repellent for Clothing - Permethrin: Permethrin-containing products are highly effective tick repellents. An advantage over using DEET is that they are applied to and left on clothing instead of the skin. Apply it to clothes, especially pants cuffs, socks and shoes. You can also put it on other outdoor items (mosquito screen, sleeping bags). * Do not apply Permethrin to skin. Tick Repellent for Skin - DEET: DEET is an effective tick repellent. Use 30% DEET for children and adolescents (AAP recommendation 2003). 30% DEET provides protection for up to 6 hours. Most often tick bites do not hurt or itch. The bump at the location of the tick bite will go away in 2 days. If the deer tick transferred Lyme disease a bull’s-eye rash around the site of the tick bite will appear in the next 4 weeks. Call your pediatrician if you are not able to remove the tick or the ticks head. If a fever or rash occurs in the next 4 weeks, the bite starts to look infected or your child becomes worse.